If you are looking for colourful foliage, in a succulent Kalanchoe fedtschenkoi ‘Variegata’ could be the plant for you. It is slow growing, however a mature specimen will be feature in any garden. Kalanchoe fedtschenkoi ‘Variegata’ is a wonderful form with stunning cream and green variegated foliage. Lovely scalloped edges with pretty pink margins. The cream leaves are centered with a mid green, the pink margins set of the cream beautifully. Reaching around 40cm in height this one is best grown in a container. It is also known as ‘Lavender Scallops’, the pink – lavender scalloped edges give this away. Best grown in a container with a free draining specialist succulent potting mix. As with many variegated plants, this is a succulent that prefers a little protection from the heat of the afternoon sun. Kalanchoe fedtschenkoi ‘Variegata’ requires a well drained position in full sun to part shade. It is frost tender, so if you are in frost prone area, try growing in a container so that some protection can be given. Again do not over water, a dry winter is appreciated. Do not mist or spray foliage as this can cause fungal problems. 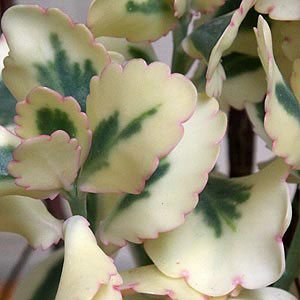 Kalanchoe fedtschenkoi ‘Variegata’ can be grown from seed, stem cuttings or leaf cuttings.